Though almost one pound in every six is spent online in the UK and despite the fact I have already written a post lauding the internet, I think that engaging in consumer activity with real human interaction, face to face or on the phone, still has a lot going for it. Let me justify my perspective with three bits of evidence / recently experienced examples. Firstly, the boring but perhaps surprising nugget of evidence. With the shift to the virtual world, many have proclaimed the end of all things physical. Whilst this may be happening with many forms of media, books are challenging these lazy assumptions. Sales of physical books are expected to grow modestly, by about 1 percent annually, every year. And it seems that ebooks, in whatever form, just aren’t so exciting any more. According to the American Association of Publishers, e-book sales in 2017 fell for the third consecutive year, off 4.7 percent from 2016, to $1.1 billion from $1.16 billion. Second, let me tell you about my beloved oven, which recently broke down beyond repair. I did the necessary research online in order to get a sense of the different options out there and what kind of deals and promotions were available. Before I made the purchase, I did a quick call to the online retailer, ao, I had selected. Having worked through my various questions with the person at the end of the phone, instead of making the purchase online, I was identified as a repeat customer (my washing machine broke several months ago – not sure I can cope with any more domestic disaster), and without asking or prompting, I was offered a £15 discount. This unexpected bonus would not have been granted if I had gone online only. My third example comes from a trip to the great extravaganza that is Bird Fair. As hinted in a previous post, I live in a household of keen birders and Bird Fair is the place to go for individuals of this inclination. Though there is obviously lots of activity online in the world of birding, including the indispensable Rare Bird Alert app to keep track of unexpected species appearing somewhere in the British Isles, as well as Whatsapp groups to keep communities of interest in the loop, going to the Fair brought particular advantages. It allowed us to visit stands and ask people the type of questions you ask when you are face to face – more informal, less structured, with immediate follow-up, more effective often than a time-symmetric drawn-out drip-flow of an email thread. You could look people in the eye to see if you trust them with lots of money for a Big Birding Trip. We managed to get binoculars repaired for free, something that would have been very unlikely to happen otherwise. And I haven’t even mentioned the lectures and talks on a whole variety of diverse topics, ranging from ‘Why birdwatching isn’t just a man’s world’ to ‘An introduction to the avian riches of North West Ecuador’ and ‘Why you should never ever write a field guide’ (surprisingly gripping). Here’s an entertaining bonus photo: of all the different recycling bins at the Fair! But there still were some I felt to be lacking, namely for food. We’ll have to go back next year to see if that is addressed – amongst other pleasures. Over the past couple of years, I have had the opportunity to dabble in numerous projects for FMCG clients. Recently, however, this pattern has shifted and I have worked on several projects in the financial services sector, giving me a chance to engage with the challenges and dynamics impacting this sector. Across all areas of commercial activity, there is increasing focus on innovation. In mature markets, growth is slow and it seems that the best opportunities to deliver against revenue targets come from not simply tweaking the existing but taking a fresh approach. When it comes to the financial sector, innovation is undeniably taking place, but a lot of this is driven by the external context, rather than established players deciding for themselves to do things differently. How money is managed is changing rapidly – thanks to changes in technology and the accompanying shifts in consumer expectations and habits. What is most interesting of all is the way that this new of ‘doing things’ is most apparent in emerging and developing markets, with mature markets lagging often behind. Think about mobile money – this initially got going in Kenya. And now look at where the most sophisticated mobile payment ecosystems exist – there are in China. In mature markets, we are hobbled by our legacy systems which make switching to quicker and more convenient processes hard. Moving to contactless payment didn’t require waiting for the technology to be invented (that was around a long while ago); the delay came from having enough retailers who had installed the pay points that could accept this payment method. In emerging markets, it has been possible to build the infrastructure from scratch, using only the latest and best, which can work seamlessly across all types of digital processes and systems. Mature markets are not only behind the curve in innovation. Some might argue there is a backlash as well as momentum to maintain the status quo. In an article earlier this year, Victoria Cleland, the Bank of England’s chief cashier, mentioned that she does not use contactless payment cards for personal spending – in part because she is yet to trust the technology completely. In Sweden, though the country is making rapid progress towards becoming the world’s first completely cashless society, there are growing concerns it is causing problems for the elderly and other vulnerable groups, as well as recognition that phasing out coins and notes could put the entire country at risk should Sweden encounter a serious crisis or war. My final observation relates to how our relationship with money, and those organisations whom we talk to about money, is changing in the core fundamentals. In the UK, being able to buy a house is not a realistic aspiration for those in early adulthood. First-time buyers now wait longer – on average, they are seven years older than in 1960, and likely to be in their late thirties. In the face of this situation, some decide they will simply rent. Likewise, buying a car no longer seems such a critical entry milestone to adult life. Instead, there is great aspirational appeal in not being tied down, and instead taking the opportunity to experience life and work in a more flexible manner. I paint an extreme picture but only to bring out what challenges this presents for financial organisations. If people are no longer buying houses or cars, gone is their opportunity to establish a long-term relationship with customers by providing them a mortgage or loan; if people are not slotting into standard regular jobs, gone is the opportunity to have salaries deposited in a nice and steady manner to build up bank capital; and with a desire to travel and focus on experiences, gone is the need for credit cards and other vehicles to facilitate spending. It is a world for the brave, with the greatest innovation found not quite where and how you might expect it. I know that the online world is no longer new but I recently had an experience which reminded me of how *cool* some of the things you can do online are. I should point out that my relationship with online ‘stuff’ is incredibly functionally driven. I have been an early and committed adopter of some internet possibilities – for example I started banking online twenty years ago, I have been regularly ordering all my groceries online for 12 years and now probably make over three-quarters of my other purchases online too. However, I haven’t been a major social media user (my life is too boring to describe to others) and still do very little on my phone (I just really prefer a proper keyboard and bigger screen). So what are my internet ‘wow’ moments? Well, the most recent one was when I finally decided to do something about getting rid of the two rabbit hutches that have been littering our garden unnecessarily for several months. The hutches are not in good condition and so not appropriate for selling on eBay. I just wanted to get rid of them but wasn’t sure they would fit in the boot of my rather small car to take to the tip. So after a quick search on Google, I found Freelywheely, which seemed much more friendly and easy to use than Freecyle, and within 15 minutes of the hutches being posted on their site, I was amazed to find I had requesters. By the end of the day, I had eight interested people, ready to drive almost an hour to pick up these rather battered hutches! And now they are gone, which is amazing. But perhaps I was just lucky and rabbit hutches are actually the most sought after freecycle item! Whilst I am at it, here are two other internet ‘wows’. Second on my list is Airbnb, which I first starting using four years ago and now have clocked up 11 trips. I just really like the fact we can rent out something for the number of days we want and not stick to the old limited arrangement of a week and Saturday to Saturday or equivalent. My third item is not so much an internet business but picks up on the transparency that the internet allows. I am someone who gets frustrated with waiting for things and I also like to know as much as possible about how long things might take. So the opportunity to track – in absurd detail – where your packages are is brilliant as far as I am concerned. However, it does set expectations rather high. I have recently ordered items off Amazon which I think are being shipped directly from China, rather than coming from a reseller based in the UK. These items have what now seems like remarkably long delivery times of four weeks. In addition, once they are dispatched, there is no further information about the item until it appears in your letter box, more often than not several months late, by which time I have already complained and been reimbursed for said item! I’m waiting for everything to be RFID tagged so I track its global journey. That would definitely be awesome. Streamlined, friction-free, hassle-free, speedy, smooth. The list could go on – what I hope these adjectives capture is how, in some elements of retail, there is an increasing focus on making the process of purchasing and acquisition simpler and quicker. Amazon is the prime example of this (inevitable pun), with various initiatives coming in thick and fast. There is Amazon Echo, through which you can place orders for music and Prime-eligible physical products; and then there are the new shops, Amazon Go, where customers can walk in, put what they want from the shelves straight into their bags and then walk out again. Now I must confess that neither of these options has particular appeal. However, I have been tempted by the simplest of all the Amazon efficiency offers: Prime delivery. As a household, we accidentally signed up for a month’s subscription, and in the interests of research, I ordered and successfully received a same-day order, with an eight hour gap between putting in my request and tearing open the package. It was probably the quickest way to get these books. I would have otherwise been obliged to go into a big bookshop in London to be sure of finding them, but it all felt rather anti-climactic in the end. Drone delivery will be more exciting. But what about the idea of going slow? Yes, I will acknowledge that this is getting attention in its own right, but in a way that is all aspirational and fetishised – think slow food, slow living, mindfulness, hygge etc. But what about slow as a practical approach to life? Communication, like shopping, has all got much easier, in particular thanks to smart phones, which means we can pick up calls, texts and emails, whenever and wherever. I would like to share with you a recent example of a surprisingly simple but highly effective way to slow down communications. This example came from a colleague who is the head of an important public institution, and thus on the receiving end for complaints and concerns from users. As most of us will have no doubt experienced, it is all too easy to get bogged down in a long and ever expanding spiralling email thread. Here is what this CEO did: in response to a ‘difficult’ email, they sent a letter back. Why it was so successful? It stopped the discussion at once: no one could be bothered to write a letter back and it seems rather odd to reply to a letter with an email. It stopped any forwarding and copying in additional individuals, as is very easy to do with emails, thus ensuring that the discussion could be tightly controlled/managed, in a perfectly acceptable way. And finally, and this is the sweetest part, the recipient was happy and no longer aggrieved. Who could fail to be pleased with a letter which is on nice, thick, headed note paper and which shows that the original comments have been reviewed and reflected upon, and have prompted a carefully considered response? Now the challenge is to think about how this tactic can be deployed equally effectively in other contexts. Not sure it would work as a means of dealing with edits to Powerpoint decks – shame! Compared to the boom consumption decades of the post-war era or the bling-times of 1980s, in more recent years, it could be maintained we have been living in a post-materialistic society. This was true in the buoyant affluence leading up to the global financial crisis and Great Recession when, putting it crudely, we had everything money could buy and we became interested instead in seeking the best, most glorious experiences. Red Letter Days, which lets you buy balloon rides and bungee-jumping as gifts, was the poster child organisation for this set of attitudes. Going through the recession and financial squeeze kept post-materialism still in there, but the motivations and perspectives behind it were different. With little spare money for excess and indulgence, we came to understand what was actually most important to us, and that was often spending quality time with family. In that environment, staying in became the new going out – a more modest experience, but an experience nonetheless. However, I wonder whether attitudes might be shifting again. Experiences are still very important, in part because of economic pressures: having experiences can be relatively be expensive (compare the cost of meal out vs cooking at home). But now ‘things’ could get more expensive too given that the low value of the pound is pushing up the price of imports. In certain sectors, we are moving to a prioritisation of ‘usership’ rather than ownership. It’s clearest with cars, when we can use Uber or some kind car rental scheme in order to answer our mobility needs other than through buying a vehicle. It’s also pretty big in media: we download films or albums when we want to watch or listen, rather than picking up a box from our shelves. This means that when we do buy ‘something’, it is rather special. Look at how everyone can’t resist getting a fine and fancy notebook in which to write their meeting notes. In addition, the idea of repairing an object and investing in making it last is getting more mainstream. Patagonia is a leader here and on its website, it is possible to access a comprehensive set of easy-to-follow repair guides, from learning how to repair a baffle on a down jacket to replacing the slider on a plastic tooth zipper. When our lives were full of wonderful experiences, we could fill post lovely pictures on social media of happy people laughing on sandy beaches etc; I am not sure photos taken whilst descaling the kettle to make it last longer will really have quite the same impact. I am occasionally inspired to write stories about positive customer experiences. It doesn’t happen that often, mind you. This time it’s Amazon’s turn to be under the rosy spotlight. Let me tell you the story…..
Once upon a time, on Jan 3rd 2015, a lucky little girl was given a Kindle Fire as a belated Christmas period. She played happily on it through out the year, but sadly, during the Christmas holidays next year that much beloved Kindle was left on the floor and trod upon, cracking the screen so badly that it no longer worked. Kind Mummy decided to get in contact with Amazon to find out what could be done. She pressed the magic May Day button to talk to a nice helpful person, realising as she did so that it was exactly a year to the day that the Kindle had been first purchased – in other words just outside the 12 month warranty period. Mummy spoke to Dee, explaining what had happened, being quite open about the fact that it was due to sloppy treatment that the Kindle stopped working. But lo and behold, Dee waved her wand and said that a new Kindle could be delivered to the little girl free of charge, but we just had to be patient and wait a few weeks for it to appear. The days went by and turned into weeks. After less time than had originally been discussed, the little girl and her Mummy had a knock at the door and took in a big brown box. Quickly cutting open the box and then, without any fuss at all, unfolding the clever special packaging inside, which didn’t have any of that nasty sharp cutting plastic, the little girl and her Mummy found a lovely new (reconfigured) Kindle shining inside. They lifted out the Kindle and switched it on. After just two minutes, by logging into her Amazon account and bringing up the profile of the little girl, Mummy was able to breathe a sigh of relief and handover a completely functional Kindle with all the games and apps and lovely things now all there to a now very content little girl. And they all lived happily ever after. My last summer holidays were enjoyable as well as being fascinating. In this post, I would like to take to share three observations inspired by this time away. 1. We talk lots about happiness, but what about fun? This realisation struck me as I spend two weeks in environments carefully designed to deliver optimum levels of fun. Yes, I am talking about our visit to the Orlando theme parks. What was particularly interesting was the fact that it soon became apparent that not all fun is equal, or more precisely, equivalent. Visiting one park after another allowed me to see that the delivery of fun can be differentiated. Disney, as one might expect, excelled at a magical fun which warms the hearts of the whole family. It offers rides, shows and experiences which don’t exclude and cater to our desire for nostalgia (if we are older), or dreams and fantasies (if we are younger). Universal is more thrilling and will instead get hearts beating faster. The rides and experiences are more intense, attacking all our senses with great energy. And they are not for everyone: it has been calculated that a total of 21 attractions at Universal Orlando have height requirements, for an average of 10.5 per park, whilst at Walt Disney World, the average is 4.75 per park. 2. Visiting Orlando also brought home the power of brands. Whilst the parks themselves are effectively brands in their own right, they also encapsulate a maelstrom of other brands. In fact, I think it would be more appropriate to use the analogy of a galaxy (that’s the park) which contains many different stars, some of which are fading, and some of which are burning bright and very strong. It’s doesn’t take long to think of some examples. At Universal, there is an ET ride, which is certainly charming, but will be lost on anyone born after 1990. Over the past couple of years there have been rumours brewing that the ride will be placed. 3. My final observation relates to the role of technology in the whole experience. Technology is clearly a very broad term and gives me licence to touch upon a variety of different angles. There is the technology that is involved in the delivery of experiences themselves. I wasn’t so interested in what makes the rides so whizzy and fast, though the use of electro-magnetic propulsion on Cheetah Hunt (at Busch Gardens) was a particular highlight. What was more noteworthy was the use of media to enhance rides, something which Universal has been accused of relying on to excess. Rather than be physically transported to different scenes, you are thrown about in your ‘carriage’ with 3D film visuals and sound bouncing around you. It worked to wonderful effect in the Simpsons ride (which was refreshingly humorous – most rides tend to be either scary, sweet or awe-inspiring). There is also more ancillary technology which acts as a facilitator to make visiting parks easier and more convenient. Here I am thinking of the park apps, of which my husband became very fond, so much so that he still continues to check them now periodically some two months after our trip! Planning a trip to minimise queueing and wasted time becomes a form of entertainment in its own right. Having chatted with other families who have done this kind of holiday, print-outs with highlighted sections and spread sheets become de rigeur. Though we personally did not use this, I should also mention the Disney MagicBands. These are equipped with radio frequency identification chips that interact with scanners throughout the park. These MagicBands allow guests to gain access to everything from their hotel rooms to rides and attractions. Though it was not straightforward to get these off the ground , they represent the ultimate in terms of CRM. Interestingly, Disney itself now prefers to talk about Customer Managed Relationships, claiming that it is putting into place initiatives that put the guests in control, despite the fact that the bands are collecting endless amounts of data for Disney about each little thing the customer does, when and where. 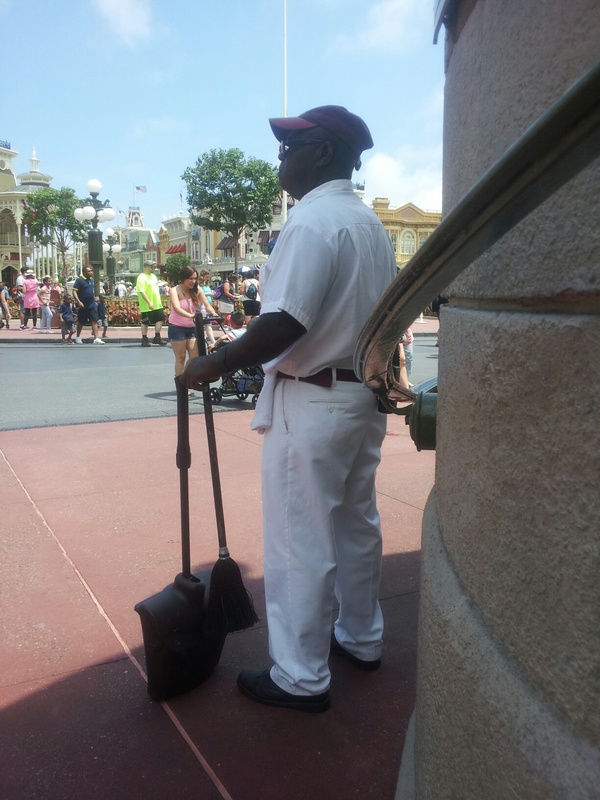 I’ll end with a bonus photo of the cleaning staff at Disney. They are in immaculate white uniforms and in constant contact with the Powers That Be to ensure they focus their efforts on where it is most needed. Disney is proud of the fact that it overmanages. When it comes to clean toilets with lots of loo roll, that’s fine by me! The above title is not meant to be derogatory. I did um-and-ah about it for a while, toying with alternatives such as ‘International British’, ‘Aspirational English’ or even ‘Fake British’, but let’s stick with the current option as I think it best captures the points I am going to make. 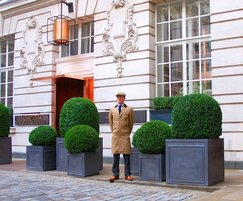 This post is inspired by a visit a couple of months ago to the rather magnificent Rosewood London luxury hotel situated in the High Holborn area, which opened just over a year ago. What is notable about this establishment is the ambition to offer something which captures a mix of British manor heritage (intriguing) and contemporary design (more familiar). The end result deserves inspection; there is good intent but actual delivery is sometimes compromised. First to the building itself – well, it is rather magnificent. It is an Edwardian neoclassical construction started in 1912 and expanded upon in four stages over nearly 50 years, during which time it was the headquarters for the Pearl Assurance Company. Here we have already encountered our first pastiche – the architectural style – which is inspired by something that was initially about simplicity, purity and careful elegance. However, 252 High Holborn is a huge soaring pile complete with gatehouse and courtyard (hence the ability to have manor house pretensions). Inside, the ‘wow’ factor comes from a combination of original features, such as the Renaissance-style seven-storey grand staircase made from seven types of marble, including extremely rare types such as Swedish Green and Statuary, and from modern additions. The most memorable of the latter is the rose bronze gallery which you encounter when you first enter the hotel before stepping through into the more expected luxury slick chic. We had the opportunity to luncheon in the Holborn Dining Room, which was perfectly pleasant. Perhaps unsurprisingly the menu also had British aspirations and included dishes which are de rigeur when trying to show local alignment: spelt risotto, fish and chips, queen of puddings anyone? Perhaps the most quixotic element was the staff. I should begin by pointing out that they were very lovely and extremely helpful. They too were part of the British manor heritage scene thanks to their uniforms, which consisted of a mish-mash of tweed, flat caps and tartan (of course). Moving on from the rather deliciously posh pantomime effect of these outfits, what was more incongruous was the fact that not one of the staff we encountered was actually British! There was a charming and extremely camp Thai butler, resplendent in his assortment of tweeds, followed by a more brooding Spaniard the next day, whilst the waiters in the restaurant were an assortment of continental Europeans and I think the grounds man/game-keeper wannabe outside in the courtyard was probably Polish. Case made. In terms of the interiors, here too we can find this international Britishness. The sides of the lobby were decorated with large paintings of English landscapes, but painted by a Chilean artist. Below these paintings, there was a disconcertingly lifelike porcelain bulldog, but being watched over by tweeting birds in vast cages serenading guests entering the lifts. Quick explanation: birds are associated with good luck and abundance in Asia (Rosewood is owned by Hong-Kong based company New World Hospitality). Rosewood acquired the very prestigious Hotel Crillon in Paris last year and are in the process currently renovating and revamping it. I am bemused by the thought of what French pastiche might be! Two old Etonian friends of David Cameron? Or perhaps a new Cbeebies series? No, it’s the name of a coffee shop that has recently opened in my neck of the woods. Normally, I wouldn’t assume that the arrival of a coffee shop is worth writing about, but it just so happens that this one is part-owned by Tesco, who are finding new ways to dominate our streets and increase their share of our spending. Here are some more practical details about the venture. The new coffee chain, named Harris and Hoole after coffee-loving characters in Samuel Pepys’ diary, will not display any information to inform customers that the company is up to 49%-owned by Tesco. The chain is being run by the Australian siblings behind the upmarket London coffee shops Taylor Street. Nick, Andrew and Laura Tolley, who set up Taylor Street in 2006, will own the majority of the shares in Harris and Hoole. Clearly, this was too good to resist and I have been to experience H&H for myself. Firstly, I must declare that an important aspect of what the founders are focussing on will be completely lost on me – they are keen to offer people the very best coffee (specially chosen beans, carefully grown and roasted etc etc), and I drink tea. It definitely did feel quite shabby, especially as they have kept the original ceiling (with damaged stucco detail) and ceramic tiles (punctured by butcher’s hooks) – which gives it all an element of randomness with genuine and manufactured character. And the vibe – well, the place was surprisingly full, and made me realise there is a more diversity in Amersham than I thought. There were the obligatory ‘ladies who lunch’ (or rather do coffee after dropping off kids), and the comfortable retirees. But there were also other representatives of society I would be more likely to find in central London than in a small commuter town – young professionals alone or in groups, busy meeting in their ‘third space’, complete with Macs and the like. All in all, it felt rather buzzy and energetic –and serene and relaxing are the adjectives I would normally associate with Chilterns establishments. I solicited opinions from my companions accompanying me on this trip. I got some much more practical responses. Apparently, it’s quite nice to feel like you have been transported into ‘happening East London’, but the fact remains the cost of a cup of coffee is noticeably pricier than in other local coffee places. For the moment, it looks like Harris and Hoole are keen to be welcomed by their community. In their tweets, they say nice things to the other local coffee shops whose fortunes they are now putting under strain, and they have put a blackboard where people can write up local events and activities. I will be interested to see if it will ever get to the H&H one year anniversary party in December 2013.